The task of the United States Army Corps of Engineers was to build a pioneer road for military traffic from Dawson Creek to Big Delta, Alaska. This meant fording rivers and creeks in the most expedient, if not permanent, way possible. The responsibility for creating a more durable, all season highway fell to civilian contractors who followed closely behind the troops and were coordinated by the United States Public Roads Administration. Though there were many timber bridges built by these civilian workers, the Kiskatinaw Bridge is the only one still in use. It is also one of the most unusual, curving nine degrees along its 162.5 metre (534 foot) length. The bridge, the first of its kind in Canada, was built in 1942-43 by Dow Construction of Toronto. Cement footings were put in place in November 1942 using gravel hauled 26 kilometres (16 miles) from a crushing plant at the Peace River. An extreme cold snap that month made it necessary to enclose all concrete pedestals and piers and keep them heated to 22 degrees celsius (72 degrees fahrenheit) for 10 days. This was no mean feat given that the work involved almost 610 cubic metres (800 cubic yards) of concrete. The bridge is a three span, timber truss structure built 30 metres (100 feet) above the stream. Approximately 500,000 board feet of creosoted British Columbia fir were used in its construction. The fir was shipped from coastal B.C. to the railhead at Dawson Creek. It should have arrived in early 1943, well before spring thaw, but was not delivered until April. Breakup made for a tough haul through the mud from Dawson Creek. Further construction delays occurred when the temporary log bridge and much of the scaffolding were damaged by spring runoff that year and had to be replaced. This three-span timber truss bridge has an amazing nine-degree curve along its 162.5 m (534 foot) length – a curve that US PRA engineers designed to accommodate the highway’s hairpin curve. 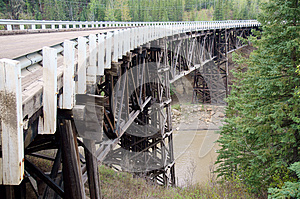 At the time, it was the first wooden curved bridge to be built in Canada. In addition to the challenge of building a significant curve into a wooden bridge, the US PRA had to contend with assembling masses of materials, shipping delays, floods and unusual temperatures – all of which extended the construction time to nine months. 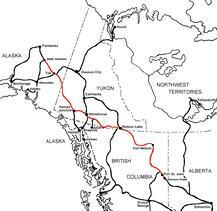 About 500,000 board feet of creosoted British Columbia fir had to be shipped from the coast. Gravel had to be hauled 16 km in from a Peace River crushing plant. An unseasonal cold snap halted the curing of the cement poured to create the bridge’s pedestals and piers, which meant the construction crew had to prevent the curing concrete from freezing. They did this by enclosing the concrete and keeping it to a temperature of 22°C (72°F) for 10 days. This was extremely difficult given that the work involved almost 610 cubic m (800 cubic yards) of concrete. There are two bridges in this area: the new Kiskatinaw Bridge (opened fall 1978) and the original Kiskatinaw Bridge, also known as the Historic Kiskatinaw Curved Bridge (built 1942-43). 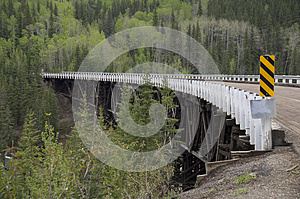 The historic bridge, located just north of Dawson Creek, British Columbia, is the only original timber bridge built by the US Public Roads Administration (PRA) that is still in use. Unique as it was, a major drawback appeared as the region developed and oil and gas companies sent heavier trucks into the area: the bridge could only handle loads under 25 tonnes. Trucks over that weight had to ford the river; therefore, the new bridge was built in 1978. The old bridge remains on a former alignment of the highway. In the postwar years, trucks with loads that exceeded the bridge’s maximum 25-tonne capacity had to avoid the bridge and ford the river instead. 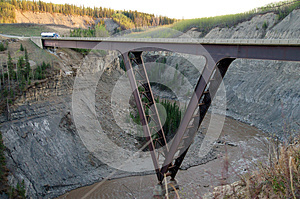 This proved especially inconvenient for the expanding oil and gas industry and, in 1978, a new road was built that bypassed the bridge and, so secured its survival. Kiskatinaw Provincial Park provides access to the river and interesting views of the bridge's structure. The campsites are large and well spaced in a mixed forest. 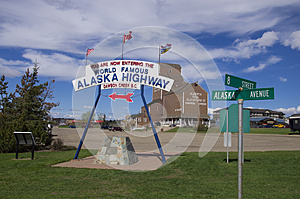 Approximately 35 km north of Dawson Creek on Highway 97 turn east onto the Old Alaska Highway. Follow the road for approximately 2.5 km where there is a fork in the road and follow the road to the left until you reach the campground.